Rocky Mountain oysters, also known as prairie oysters in Canada, is a dish made of bull, pig, or sheep testicles. The organs are often deep-fried after being peeled, coated in flour, pepper and salt, and sometimes pounded flat. This delicacy is most often served as an appetizer with a cocktail sauce dip. 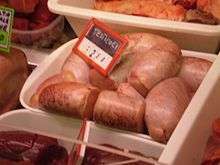 It is a well-known novelty dish in parts of the American West and Western Canada where cattle ranching is prevalent and castration of young animals is common ("prairie oysters" is the preferred name in Canada, where they may be served in a demi-glace, not deep-fried). In Oklahoma and the Texas Panhandle, they are sometimes called calf fries but only if taken from very young animals. In Spain, Argentina and many parts of Mexico they are referred to as "criadillas," and they are colloquially referred to as huevos de toro (literally, "bull’s eggs"; besides its literal meaning, huevos is a Spanish slang term for testicles) in Central and South America. 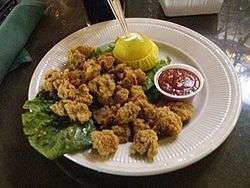 Rocky Mountain oysters are sometimes confused with lamb fries or animelles (lamb testicles), which are served in a similar manner. A few other deceptive terms, such as "cowboy caviar", "Montana tendergroins", "dusted nuts", "bull fries" or "swinging beef" may be used. The dish, purportedly cowboy fare, is most commonly found served at festivals, amongst ranching families, or at certain specialty eating establishments and bars. They are, however, also readily available at some well-known public venues (e.g., at Coors Field during Colorado Rockies baseball games). Eagle, Idaho, claims to have the "World's Largest Rocky Mountain Oyster Feed" during its Eagle Fun Days (now held the 2nd weekend in July). The primary goal of testicle removal is not culinary. Castration in veterinary practice and animal husbandry is common and serves a variety of purposes, including the control of breeding, the growth of skeletal muscle suitable for beef, and temperament alteration. Earles, Jim. "Rocky Mountain Oysters: Expanding on the List of Organ Meats," The Weston A. Price Foundation. Brown, Patricia Leigh. "Delicacy of the Wild West Lives on for Those So Bold," The New York Times, Wednesday, March 18, 2009. Lakey, Dwight, Songwriter. "Rocky Mountain Oysters," Songwriter Dwight Lakey's (ASCAP) song about Rocky Mountain oysters, © 2007 Brown Barn Publishing & Dwight Lakey, Danville, VT, & Julesburg, CO; All Rights Reserved.